I’ve just returned from teaching, coloring, and getting to know some of the wonderful artists of the Rocky Mountain Bead Society. 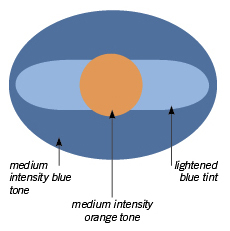 During my class, “Courting Complements,” many a groan was emitted when we began exploring the unique characteristics of blue and orange. Turns out that pure blue and orange are everywhere the media is in Colorado, because they are the Denver Broncos football team colors. The RMBS artists are, understandably, tired of seeing it. This lit a fire under everyone and they excitedly rose to the challenge. Because everyone keeps the color creations they make in my classes, I don’t have the exact swatches to show you. But they concocted some of the most gorgeous blue-orange palettes that I’ve ever seen. And not once did the football team come to mind. The RMBS bead artists accomplished this by using tints and tones: they altered the value and intensity of blue and orange as much as possible to distance the combo from the fully-saturated one of the Broncos. 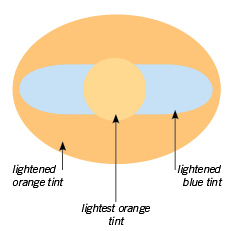 Remember, tints are colors lightened with white. 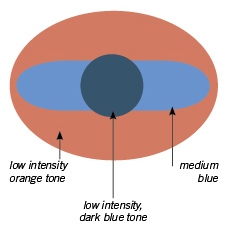 Tones are colors to which a complement has been added. Tones are lower in intensity than the pure color. They also altered the value (value refers to a colors’ lightness or darkness). Here are replicas of some of the combinations they created.